No matter where you’re off to on your beach holiday, there’s two things that you need to be confident in and that’s your swimwear and your SPF. When I was in Costa Rica earlier this year, I was rocking my gorgeous summer blue poolside outfit from Simply Be. Combining coordination items from the Simply Yours range with the Sarong Skirt with the plus size Bandeau Bikini Top and High Waisted Bottoms, I felt every inch the bronzed goddess; comfortable, confident and stylish. Walking along the beach and lazing by the pool sipping on a cocktail from the swim up bar, I didn’t have a care in the world, not least because I knew my body was so well protected with the sun care I had taken with me. When it comes to SPF, you simply can’t beat Clarins. Tried and tested countless times, I’ve bought more bottles of their sun care than I care to imagine! The Clarins sun care range is very much a hybrid between skincare and sun protection with a comprehensive range of products specifically designed to protect the face and body separately. I took this photograph when I was at the Bliss Sanctuary For Women in Bali– the most amazing place for a truly life changing experience! Two of my favourites are the Clarins Sun Care Milk Lotion Spray in SPF 50+ and the Clarins Sun Wrinkle Control Cream For Face, again in SPF 50+. I like my SPF to always be in the highest factor that I can get; skin cancer doesn’t like to mess around and neither do I. Protection is EVERYTHING and it’s important to dispel the myth that higher factors prevent you from tanning; they absolutely do not. High factor SPFs simply offer you a higher level of protection so that you can stay out in the sun for longer without burning. The higher factor also cuts down on the amount of reapplications, aside from if you’ve been swimming, excessively sweating and alike. You’ll notice that I have separate products for the face and body; that’s because products designed to be used on the body are formulated with different ingredients to those designed for the face. Whenever I used a body SPF on my face in the past, I would break out as my pores would get clogged, so ever since I discovered facial SPF’s, I haven’t deviated away from them. My favourite SPF for the face is undoubtedly this one from Clarins. I’ve tried lots on the market and while there’s some that I do really enjoy using, this one is my absolute favourite. The Sun Wrinkle Control Cream For Face offers multi-cellular protection as well as having plenty skincare benefits too. Squeezed out of the tube, a little goes a long way and once applied, you’re left with skin thats highly moisturised, hydrated and well protected; I’ve never once burnt when wearing this SPF whether that be at home or on holiday in exotic places like the Costa Rice where I took these photographs of my Simply Be Bikini. I’m loving their swimwear range this year; they’re the one plus size brand that I see killing it with their swimwear all year round which I really appreciate as I’m someone that loves to go on holiday during the winter time when its cold and rainy here! The Clarins Face SPF has plenty of anti-ageing ingredients such as soothing aloe, kiwi, olive tree and baobab which is very nourishing on the skin. It helps to prevent sun-induced age spots too but still enables you to achieve a gorgeous golden glow. I’m sure plenty of people want that bronzed tan when they’ve been on holiday but it’s important to achieve that without burning and increasing your chances of skin cancer and premature ageing caused by the sun. My favourite thing about this SPF however is that it doesn’t clog my pores and cause me to get spots, it doesn’t strip or dry out my skin and my eyes don’t sting if I get any in my eye when sweating on a hot day. I can use it alone or under makeup, at home or away which makes it perfect for me! For those who prefer a lower factor, SPF 15 and 30 is available which is by no means low but if the 50+ is available when you’re at a Clarins counter, that’s always going to be the one that I recommend! 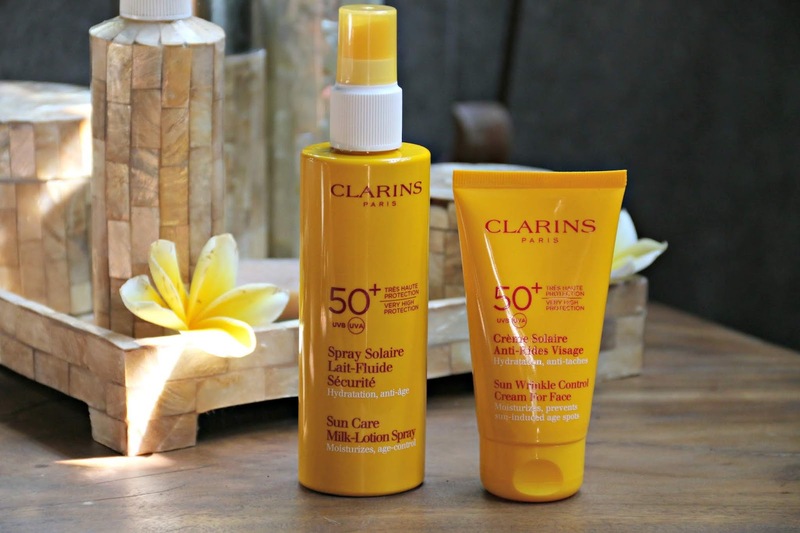 For the body, I love the Clarins SPF 50+ Sun Care Milk Lotion Spray which is light, hydrating and doesn’t leave the skin feeling sticky or clogged. Quick and easy to apply, simply spray on, glide your hands over your skin and you’re good to go. It absorbs fast so you can spend less time faffing on in the room and more time outside enjoying all that the summer has to offer. If you’ve used a Clarins body lotion before then I would liken the after effects to a light one of those, except with the added sun protection benefits and again, I’ve NEVER burnt while using this suntan lotion. Clarins suncare products are available in countless department stores such as Debenhams, House of Fraser and from Boots pharmacy on the highstreet and online. I’ve linked some of my most trusted and well used retailers below. Always look out for the gift with purchase deals that Clarins do as their sample sizes are incredibly generous and will also see you through your holiday. In my opinion, they’re without a doubt the best skincare brand for samples and even if there isn’t a deal on, ask for some product samples at the counter. I have tried SO many products out that way and have subsequently bought so many as a result. Its great to try something out at home to see how it works for you before committing to the full size. Trust the advice and recommendations of the Clarins counter staff too; I’ve never been given a bad piece of skincare advice from them yet! They really know their stuff as a result of extensive training and an in-depth product knowledge. If you’re passing through World Duty Free this summer then I would highly recommend picking your Clarins products up from there as you’ll be able to bag them at a discount. That’s what I do with all of my old faithful products like the SPF. You cannot put a price on your sun protection that’s for sure but if you can get your favourite products with a little bit of money off then that’s a saving you’re going to want to make! I’ve written extensively about my love for Clarins products on my blog so if you’re looking for SPF recommendations, you’ve come to the right place. Check out my post all about my favourite Clarins SPF here, my review of their aftersun here and thoughts on their Instant Smooth Self Tanning here. Where are you going on holiday this year? What is your favourite Clarins product? How confident do you feel in your swimwear? I like that a little goes a ong way, that means it won't be too greasy. Thanks for sharing! I have not tried Clarins, but have always heard wonderful things about the brand. Glad to hear an honest review and will have to try. I've heard great things about this sunscreen, thanks for sharing more info! Sounds like the perfect one to use. Love your bathing suit!! I haven't tried Clarins before but I've seen it in department stores. I try to use separate sunscreen for my face, but sometimes I just slather on my kids' sunscreen in a pinch! IT looks very nice on you! The blue is so brilliant; I love it! You are inspirational. I love that you are feeling confident. I definitely lack confidence these days. I love your blue swimsuit with wrap around, it is perfect for the beach. Looks like an amazing day out too. That is such a beautiful color! I love a great skirt/sarong. It always gives me that extra coverage to go from the beach or pool and right to the lounge if I want.